Once a flourishing port of the Pallavas of ancient India, this monument centre is today a major beach resort holiday centre in south India. 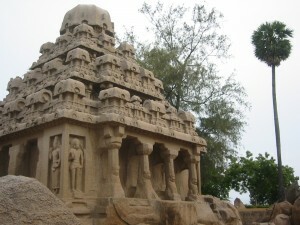 Places to see include the Shore Temple, the five Rathas and Arjuna’s Penance and the Tiger’s Cave. About 14 km north is a Crocodile Farm and 17 km west is Tirukkalunkkundram, a pilgrim centre known for its holy kites. There are boating facilities at Muttukadu backwaters. Midway between Chennai and Mamallapuram there are amusement complexes like VGP Golden Beach, MGM Dizzy World and Little Folks. Air: The nearest airport is 50 km from Chennai. Rail: Nearest railway station is Chengalpattu 30 km from Chennai. Road: Frequent buses are available from Chennai and other important towns. This entry was posted in Mamallapuram, Tamil Nadu. Bookmark the permalink.